Weighing the Elephant ~ Learn to Read with English Stories for Kids No Reviews Posted. 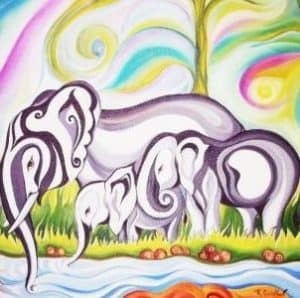 A long time ago, people who lived in China knew that a strange, amazing beast called an elephant lived in a faraway land, but no one had ever seen one. One day, a ruler came to see the Emperor of China. He brought a gift, and that gift was a real, live elephant! Never in China had anyone seen anything like it. As soon as the royal guest left, it was all anyone at court could talk about. “This elephant is bigger than a water buffalo!” said one mandarin. He brought a gift, and that gift was a real, live elephant! All eyes turned to the voice. It was the Emperor’s son! The boy described what to do. Can you think of a way, too? Think for a bit, and see what you come up with. Here is what the boy said. “You put the elephant in a big boat and take the boat out on the water. Draw a line on the side of the boat where it meets the water, at the watermark. Then bring the boat back to shore and take the elephant off the boat. Put rocks on the boat, one by one. When the boat sinks to the same watermark line it had when the elephant was in it, bring the boat to shore again. Take out the rocks and weigh them, one by one. That is how you can tell how much the elephant weighs!" “It will work!” called out the first mandarin. “What a clever plan!” said the second. “Who knew this child would know?” said the third. And the fame of Emperor's son traveled far and wide.